Welcome to 2013! Even typing that makes my heart flutter a little- as it’s now the year we get married – it’s no longer “next year” and that makes it feel ridiculously close and real. With just over 3 months to go until Our Big Day, we’re now in the middle of the “practicalities” of the planning process. According to the Great Wedding Planner, our invitations should already be out by now… so we were quite keen to get our save-the-dates out and make up for being a little behind schedule! 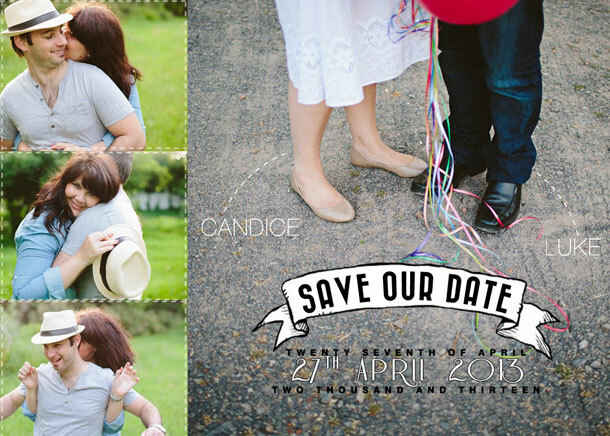 We had planned fairly intricate save-the-dates – involving matchboxes, magnets and the tiniest, handmade bunting known to mankind. However, sourcing 70 tiny magnets and making the smallest bunting imaginable took a lot more time than we’d planned for. We’d wanted something special, memorable and a little different – but the practicalities won. There was simply not enough time, and we had to compromise. It was a lesson we had to learn sooner or later – and I’d rather it be now, than a week before the wedding. Simply, not everything is going to work out like you’d planned. Luke and I even have a phrase for it now : “getting our zen on”. Being calm, accepting changes as they come, and trying not to get too flustered. Just in case I needed a little more practice in “getting my zen on” last week I realized the wedding dress idea I had been counting on, wasn’t going to work – mainly due to dry-cleaning problems. So, it saw me looking for a new wedding dress this past Saturday. Thankfully I found one relatively easily, but I had to keep my panic-button in check for a few days beforehand, to stop myself from spiraling into a frenzy of “what ifs” and worse case scenarios. So, my lesson for the week – get your zen on. Not everything will go to plan, but it will still be your wedding, and it will be beautiful and perfect – at the end of it, you will be married to your love.